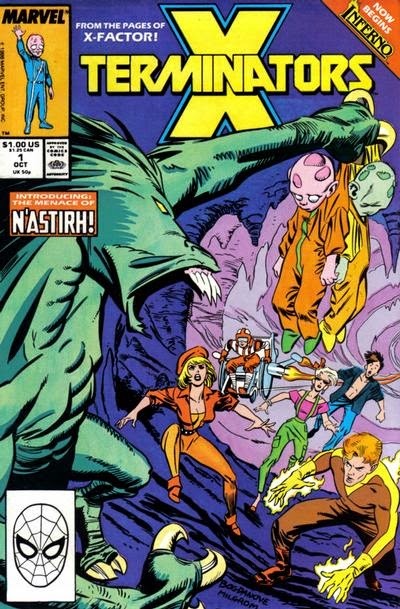 Excalibur battles the Crazy Gang inside Murderworld. In Murderworld, Courtney Ross comes face to face with the Crazy Gang, confused as to why Captain Britain and the rest of Excalibur aren't doing anything, not realizing the two teams' have switched minds. Determined to put some distance between their foes, Excalibur-as-the-Crazy Gang grab Courtney and run off. From the control room Arcade watches this when Shadowcat suddenly appears, phasing through the monitors. Leaving Lockheed to guard Miss Locke and Mr. Chambers, she pulls Arcade into Murderworld. Shadowcat then proceeds to take control of Murderworld using a program she and Doug Ramsey wrote together, turning Murderworld against Arcade as Courtney continues to flee from the Crazy Gang. The two teams collide on Murderworld's stage set, and Captain Britain, still trapped in Tweedledope's body, gives Courtney a device he created. 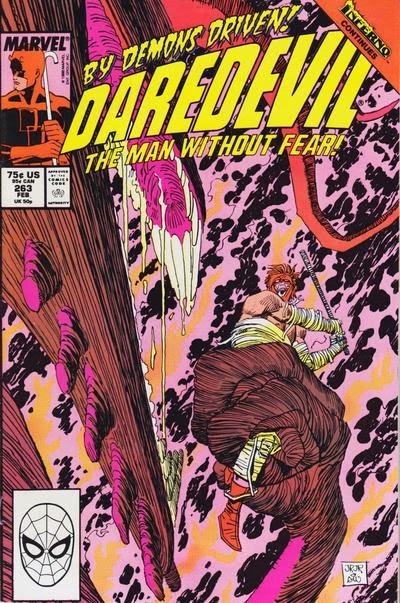 Daredevil #263 by Ann Nocenti & John Romita Jr.
Avengers #300: Working together, the Captain, Mr. Fantastic, Invisible Woman and the Forgotten One manage to defeat Nanny and the Orphan Maker. As they work to free Franklin Richards from the armor into which Nanny placed him, the boy is captured by demons working for N'astirh. Freeing him from the armor, N'astirh uses Franklin's vast power to reinforce the portal between Earth and Limbo, but the heroes, joined by Thor, track Franklin and free him before defeating a Growing Man android activated by Kang. With the portal closed and the demon effect fading, the heroes retire to the Richards' home, where the Captain, inspired by recent events, reiterates the importance of the Avengers, and asks the assembled heroes to join him in reforming the team. August looks to be a fairly straightforward month: as the summer heat dies down, so too does "Inferno", which will come to an end as the month closes out. Bart enjoys fifteen minutes of fame after saying "I didn't do it" on Krusty's show. During a field trip to the box factory, Bart sneaks off to visit the nearby Krustylu Studios and ends up becoming Krusty's personal assistant, eventually appearing on an episode of his show and declaring "I didn't do it" after accidentally knocking over the set. Conan O'Brien, who was of course a former writer on the show before leaving to take over Late Night, appears in this episode as himself. The writers decided to write him into the episode and put Bart on his show before they knew for sure whether O'Brien got the gig, and O'Brien himself believed his show would be cancelled before this episode aired. 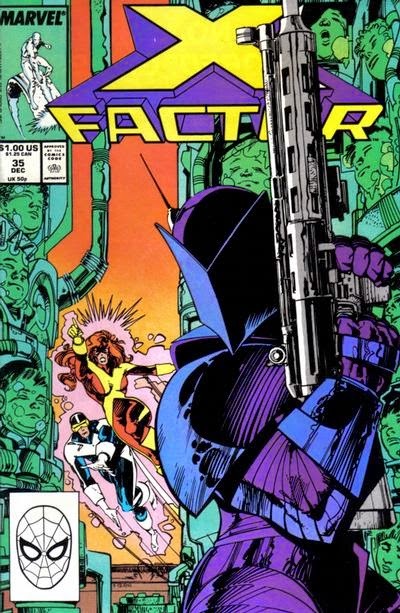 In New York, X-Factor battles demons while on the trail of Cyclops' infant son Christopher. They draw nearer just as a demon delivers him to N'astirh. He then teleports away with the child, only to return moments later, joined by Madelyne in her Goblin Queen attire. Calling out Cyclops for abandoning her and their son, she attacks the team. 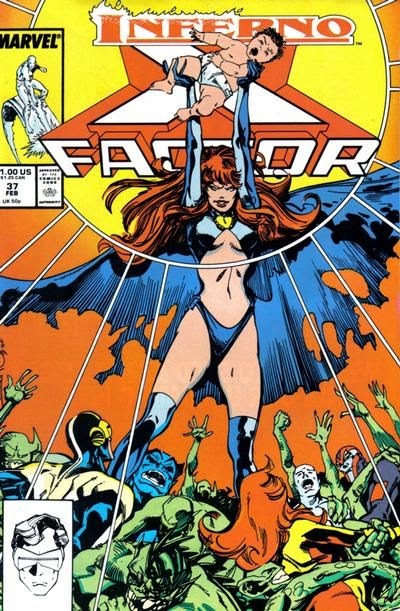 X-Factor defends themselves, but holds back from harming Madelyne at Cyclops' insistence. When Madelyne realizes Marvel Girl is sharing the baby's thoughts, she blasts her, but N'astirh blocks the attack, hoping to keep X-Factor alive longer, in order to continue to goad and enrage Madelyne. She turns on her ally, declaring she is no longer his puppet. N'astirh teleports away, not caring what she is, so long as she does what he's set her to do: sacrifice her son to unleash his power and blast a permanent hole to Limbo. 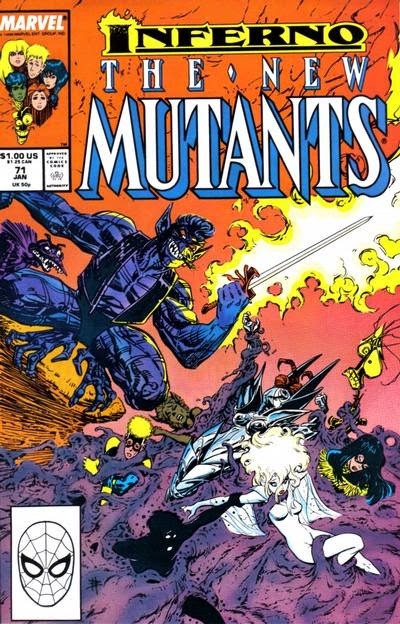 The New Mutants battle the demon rain as Illyana struggles with her dark side. 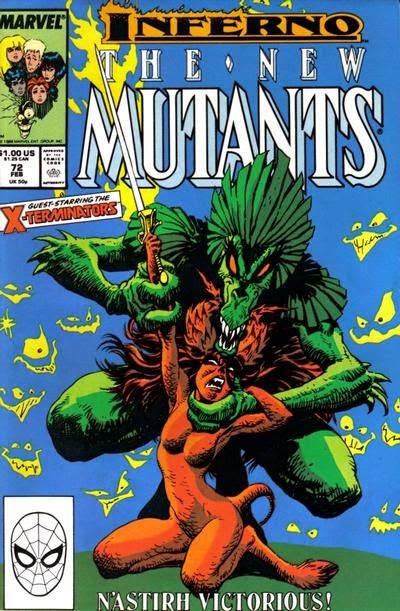 In Times Square, S'ym appears before N'astirh and the New Mutants, and the two demons begin to fight one another, with N'astirh teleporting Illyana away. Otherwise forgotten, the New Mutants attempt to disrupt the pentagram, reasoning that closing the portal between Earth and Limbo may very well help Illyana as well. Meanwhile, Illyana appears in a demonically-possessed diner, where inanimate objects urge her to use her sword to attack the possessed people inside before she is teleported away again. In the skies over Times Square, the New Mutants meet the X-Terminators, and the two groups team up to try and close the portal. Illyana next arrives in a demonic pet shop and is once again urged to use her sword, and she realizes the demons want her to use it to spill innocent blood in order to seal her dark transformation. In Times Square, the New Mutants succeed in rescuing the mutant infants and disrupting the pentagram. 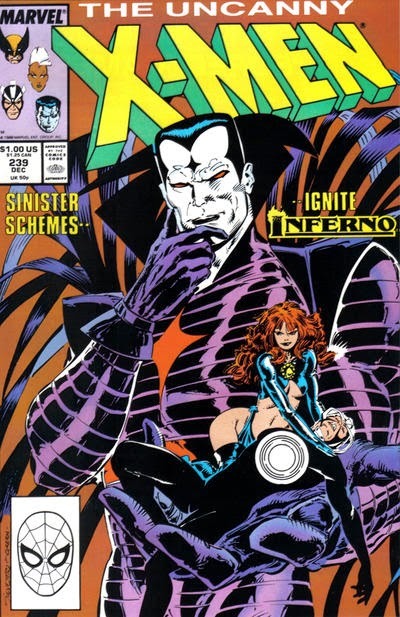 "Inferno Part the Second: Fan the Flames"
In the secret high-tech catacombs beneath a Nebraska orphanage, Madelyne Pryor attacks Mr. Sinister, who claims to be her father. Mr. Sinister shrugs off her attack and traps her in chains as N'astirh disappears. Meanwhile, the X-Men and the Marauders find themselves in the midst of a demonically-possessed Manhattan, as inanimate objects and even the police have become enchanted. In Nebraska, Mr. Sinister asks Madelyne to share a childhood memory, but the only one she can recall is actually a memory of Jean Grey's. In Manhattan, the X-Men and the Marauders continue their battle, with the X-Men growing increasingly savage. Back in Nebraska, Mr. Sinister explains how he cloned Madelyne from a sample of Jean Grey's blood and tissue, but that she didn't awaken until after the Phoenix sacrificed itself on the moon. 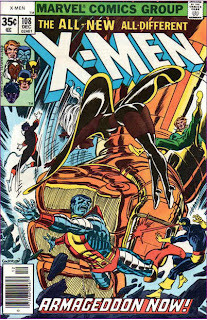 In Manhattan, Colossus learns his sister has been deposed as ruler of Limbo, and, with his teammates now enchanted themselves, leaves to help her on his own, in order to end the demonic invasion. Lindsay & Silver Samurai work to free Wolverine from the Black Blade. 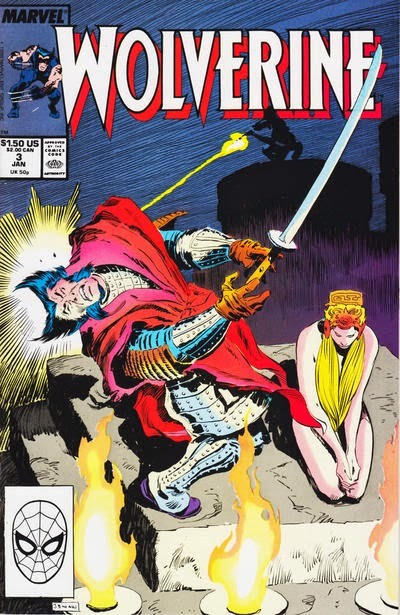 As Lindsay and Silver Samurai watch, Wolverine, possessed by the Black Blade, escapes into a burning building with Jessica Drew, leading Silver Samurai to believe that Wolverine intends to sacrifice her. The pair goes to the Princess Bar, where O'Donnell is holding the captive Black Blade cultists. In order to learn where the sacrifice will take place, Lindsay tricks the captives into believing she's tortured and killed one of them. Together, the three head out to an old temple in the jungle outside the city. Leaving O'Donnell outside to deal with the authorities should they fail, Lindsay and Silver Samurai enter the temple. While reminiscing about her past with Captain Britain, Courtney Ross is attacked in her office by the Crazy Gang. She manages to get past them and out into the street, only to be captured by a waiting Arcade. The next day, Kitty and Rachel are shopping when Kitty realizes the money she took out of Courtney's bank was made by Arcade. Meanwhile, at the lighthouse, Kurt and Meggan flirt as Kurt builds a jungle gym, with the pair almost kissing just before the rest of the team comes home. 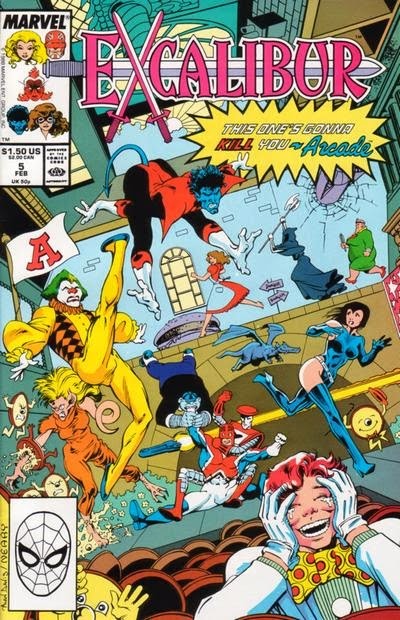 Kitty shows everyone the money, from which they deduce that Arcade, looking for revenge on Captain Britain, has captured Courtney, and where to find her. Brian, enraged, attempts to fly off in a rage but Rachel holds him back as Kurt points out that Arcade clearly wants them to come after her, so they must find a way to beat him at his own game. 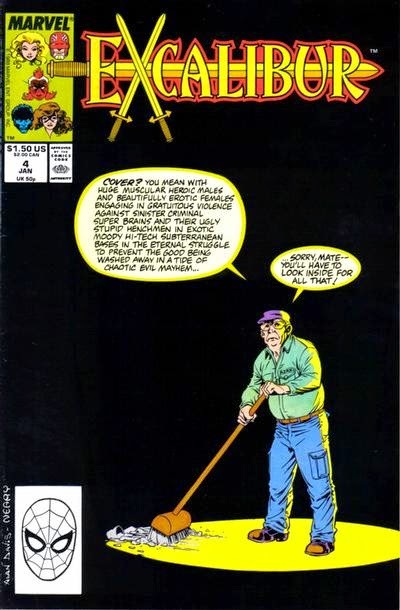 Daredevil #262 by Ann Nocenti & John Romita, Jr.
Amazing Spider-Man #311: Spider-Man battles Mysterio, believing the odd happenings caused by Limbo's invasion of Earth to be nothing more than illusions created by his foe. Avengers #298: Avengers butler Jarvis is attacked by demons and possessed objects in New York, and he alerts the Captain to the state of the city. 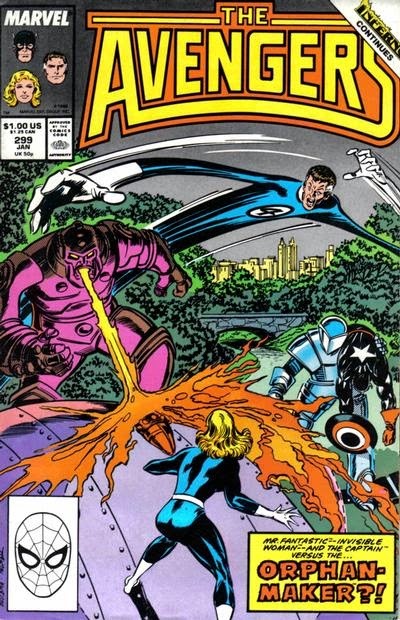 Avengers #299: The Captain teams up with the New Mutants against the demonic invasion of Limbo. Hoping to find help in determining the cause of the invasion, he seeks out Reed Richards, who has retired from the Fantastic Four. The Captain arrives at the Richards' Connecticut home just after Nanny and the Orphan Maker capture Franklin Richards. Together, the Captain, Mr. Fantastic and the Invisible Woman battle the villains, but are overcome when a brainwashed Franklin, wearing a suit of armor, attacks them. Just then, they are joined by the Eternal Gilgamesh, come to Earth to battle the demon hoard, and vow to free the Richards' son. 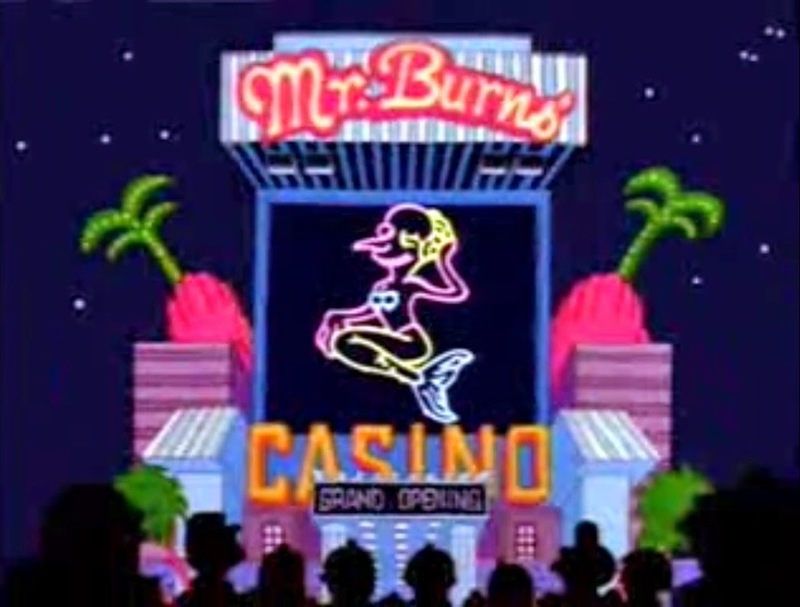 Springfield legalizes gambling, leading to Mr. Burns building a casino which soon draws into its orbit the Simpson family. Faced with an economic downturn, the citizens of Springfield vote to legalize gambling in order to kick start their economy. This episode introduces Marge's gambling addiction, one of those rare bits of continuity the show will actually hang onto and reference occasionally. 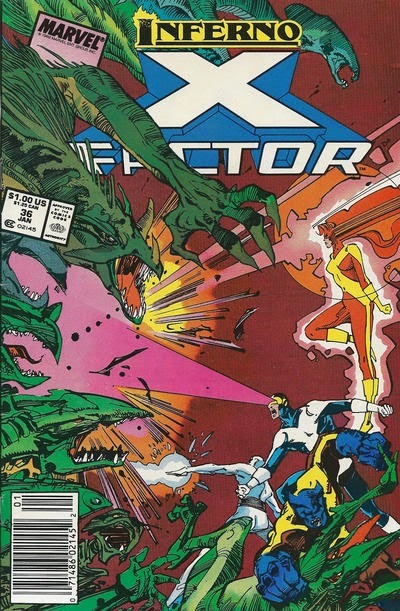 X-Factor battles the demonic Inferno in Manhattan. Beast and Iceman are battling possessed objects in Manhattan, as Trish Tilby reports on the state of the city. During a break in the action, Trish and Beast talk, with Trish unsettled by Beast's recent transformation. Just then, she and her cameraman are eaten by a demonic subway. 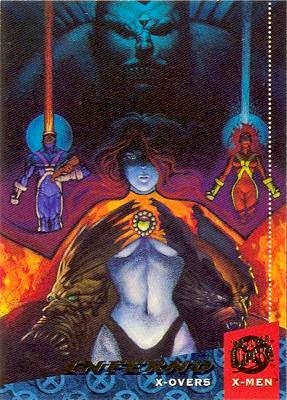 Elsewhere, N'astirh muses on his manipulation of Madelyne Pryor, then appears before Death, sensing the darkness within him and attempting to sway him to N'astirh's side. When Death learns N'astirh empowered Hodge, he vows to unleash his evil on the demon. Meanwhile, Cyclops and Marvel Girl, telepathically following the cries of Cyclops' son, arrive in Manhattan as Beast and Iceman manage to climb aboard the subway which ate Trish. Cyclops and Marvel Girl are attacked by a possessed jetliner, while Iceman and Beast manage to stop the subway when it tries to cross the Manhattan Bridge. Illyana is tricked into opening the portal that brings Limbo to Earth. With Illyana unable to open a stepping disc out of Limbo, the New Mutants attack S'ym and his the demon horde. During the fight, S'ym manages to wrest Illyana's Soul Sword from her grasp. Realizing she can still teleport within Limbo, Illyana escapes with her teammates. Just then, N'astirh contacts S'ym from Earth, admonishing him for trying to kill Illyana and revealing it is his magic which is keeping her from leaving. The New Mutants emerge in Belasco's former throne room, and when S'ym's demons track them there, Illyana jumps the team into the past, where they see her as a small girl shortly after she arrived in Limbo. They watch as N'astirh saves the young girl from S'ym. Back on Earth, Magneto and the Inner Circle are attacked by the growing Empire State Building, and the White Queen's hears the telepathic cries of the tourists inside as they're killed. "Strike the Match: Inferno Part the First"
The X-Men locate and attack the Marauders. At the Rainbow Room in New York, Alex and Madelyne spend a romantic evening together, even while the city continues acting strangely. As the evening ends, they return to Australia, after which Madelyne immediately leaves for Bard College. 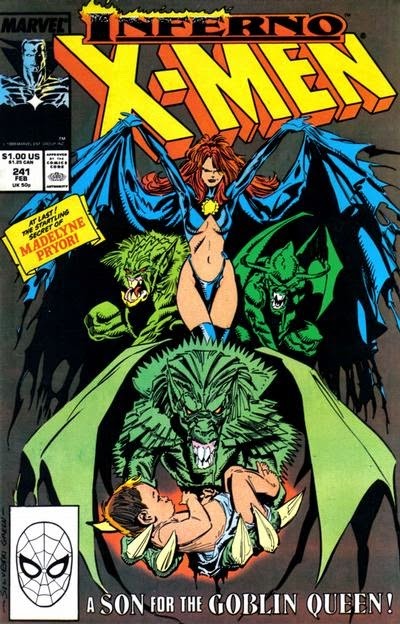 Now in her Goblin Queen attire, she visits Jean Grey's grave, admonishing the woman for returning to life and ruining Madelyne's life, then transforms Jean's parents into demons. Just then N'astirh arrives, promising her a lead in the search for her son. Back in Australia, Dazzler and Rogue fight over Rogue spending time with Longshot, while Alex informs Wolverine and Storm that the computer system has finally located the Marauders, moving into the Morlock Alley. "Invasion of the Baby-Snatchers" / "Speed Demon!" / "Guess Who's Coming to Dinner?" / "Finale"
The X-Factor wards band together to battle the demonic invasion of Earth by Limbo. Issue #1: In Limbo, S'ym orders N'astirh and his Nastiri to go to Earth and steal thirteen mutant babies for the performance of S'ym's Dread Rite. The demons arrive on Earth and take over mausoleum as their headquarters. Meanwhile, Rusty turns himself in to the naval authorities as Marvel Girl drops Artie and Leech off at their new school, St. Simons. Iceman then delivers the rest of the kids to Phillips Academy. At St. Simons, Artie and Leech befriend an abrasive student named Taki, a mutant with the ability to manipulate technology. That night, Taki observes a group of demons kidnapping Artie & Leech, believing them to be infants because of their bald heads. None of the teachers believe his story, and unable to reach the older kids, he transforms his wheelchair into a helicopter and flies to their school. After relaying what he saw to Skids, she, Boom-Boom and Rictor leave with Taki, and proceed to break Rusty out of jail to lead them in their efforts to rescue Artie and Leech. Homer is tempted by an attractive new co-worker who shares his interests. After barely escaping from a gas leak, one of Homer's co-workers is fired, and when the Department of Labor calls into question Mr. Burns' dubious hiring practices, Burns is forced to hire a woman to fill the vacancy. The voice of Mindy is provided by Michelle Pfeifer, who was arguably at the peak of her popularity when this episode aired. She is one of the few characters on the show not to feature in a later episode. 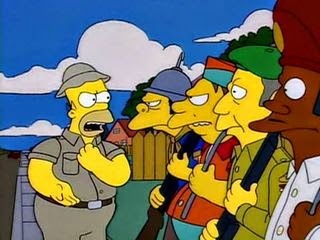 "Go to the Orphan Maker!" Cyclops & Marvel Girl battle Nanny & the Orphan Maker. In Manhattan, Beast and Iceman patrol the streets, protecting citizens from inanimate objects run amok. In Nebraska, Cyclops and Marvel Girl arrive at the orphanage where Cyclops grew up, and sneak in through the attic. Their subterfuge soon turns out to be unnecessary though, as the staff and children at the orphanage don't seem to notice their presence. As they head towards the basement, Cyclops is bombarded by jumbled memories of his childhood. Meanwhile, above the orphanage, Nanny arrives, seeking to rescue the mutant babies inside, and she sets Orphan Maker and her super powered Lost Boys and Girls to the task. Below, Cyclops and Marvel Girl discover a massive subterranean complex beneath the orphanage, inside of which are scientists tending to babies within suspended animation pods. Above, a group of demons dispatched by N'astirh arrive, also seeking the mutant babies and Cyclops' son. The New Mutants escape Spyder but at the cost of Lila. In Spyder's lair, the captured New Mutants attempt to escape their cage, but are unable to do so, and Illyana is reluctant to teleport to Limbo due to the state of things there. As Spyder gloats, he restrains Gosamyr, then leaves to witness the unveiling of her family. Meanwhile, back on Earth, Magneto arrives in Manhattan for a meeting of the Hellfire Club and is attacked by a possessed fire escape. Back on Spyder's planet, Gosamyr enters a metamorphic state called the minor death to escape her bonds and become invisible. 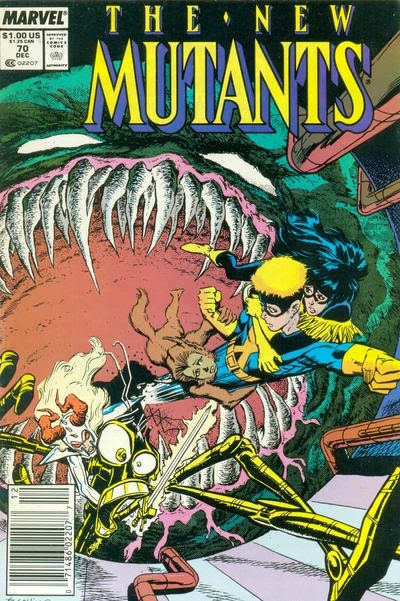 Attacking Spyder's guards, she knocks one into the New Mutants' cage, its body draining enough energy from the cage that the New Mutants are able to escape. They race after Spyder and Lila, intending to rescue Lila and save Gosamyr's family. Just then, a group of massive cocoons begin to open, and monstrous beings, Gosamyr's family, emerge. 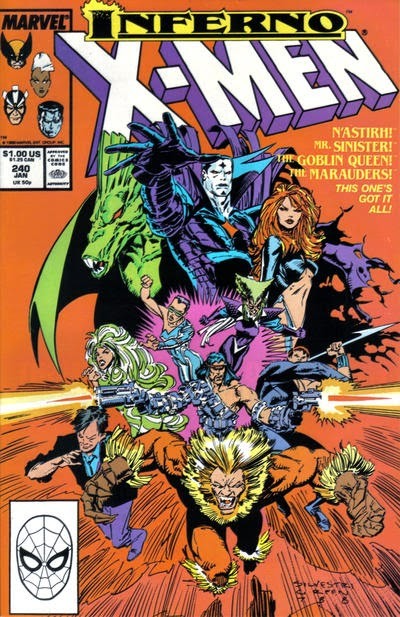 Mr. Sinister muses on the X-Men as Madelyne works to find her son. In New York, with the heat wave continuing, a demonically-possessed Empire State Building eats a family of tourists. Another day in a another place, Mr. Sinister reflects on the believed-dead X-Men. He is interrupted by Malice, who is angry after discovering she is unable to break her bond with Polaris' body. Mr. Sinister admits he hoped that would be the case, saying he only intends to make her stronger. In Australia, Dazzler performs at a local saloon as Longshot watches. Storm, searching the computers for information on the Reavers, discovers footage of an X-Factor press conference, and realizes Jean Grey is alive. She angrily confronts Wolverine about it, and he admits he suspected as much, but was scared to find out for sure. In the caves beneath the town, Psylocke, Rogue and Colossus train, and Carol Danvers once more takes control of Rogue's body after a particularly nasty psychic attack from Psylocke.